Discolouration is normal in timber fences, but only to a certain extent. Generally, in a treated timber fence, you can expect to see some darker discolouration in areas. But that discolouration shouldn’t appear all over your fence, and it shouldn’t appear damp all the time. If it does, your fence might be rotting. If your fence is rotting, then a replacement is the only solution! If you can see evidence of termites around your timber fence, you’ve got a problem. Termites love timber fences, which means fences are often the first to go in termite affected properties. If they’ve made a home in your fence, you might see what appears to be sawdust gather at the base of your fenceposts. If you do, you’ll probably need a fence replacement. But before you get one, make sure you call in the experts to deal with the termites first! If your aluminium pool fence is looking a little battered, you need to replace it as soon as possible. The reason is safety; pool fences are designed to keep kids out of harm’s way. But if your pool fence has larger than normal openings in its bars, there’s every chance a small child could find their way through. That’s why attention is key; always check on your pool fence’s condition, and don’t be afraid to get a replacement when you need it. It’s not uncommon for timber fences to develop holes where knots in the timber used to be. But sometimes, holes in your timber fence can indicate some more significant damage. For example, termites are often responsible for weakening timber fences, and creating relatively innocuous looking holes. Often, these can develop into splits later on, and even weaken fence pales to the point of snapping. We’ve all seen leaning fences before, and they look a bit sad. But surely they can be straightened without a full replacement? Well, not often. In a lot of cases, leaning fences tell of rotten fence posts and soft ground. In our experience, when a fence leans, replacement is the only effective solution. Finally, does your fence look a bit out of place? If so, treat your self to an upgraded replacement! Last but not least, it’s important to ask yourself how you feel about your fence. Does it offer the privacy and aesthetic you want? Or did it just come with the house? If you’re not set on your fence, that’s as a good a sign as any that it could use replacement. So speak with the experts and find some fencing options that tick all the boxes! If you’re looking to replace your fence, get in touch with the experts at FenceCorp (07) 3715 5055. Posted in Advice, Fences, Updates. Bookmark this page. The fence looks really excellent, just what we wanted and we were really impressed with how smoothly it all went. So thanks very much! 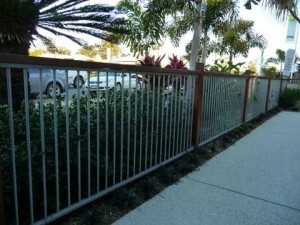 FenceCorp delivered a stunning result. We would definitely recommend your company.